How Is Your Eye For Color? As quilters, we are drawn to color. We might have a favorite color, or prefer certain color combinations in the quilts that we see and those that we make. Some quilters like bright colors. Some prefer muted. 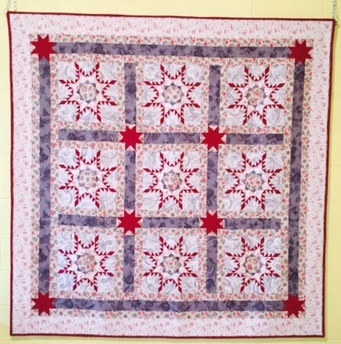 My husband says that he can spot my quilts a mile away, because I prefer muted colors that blend into each other. What are your preferences? 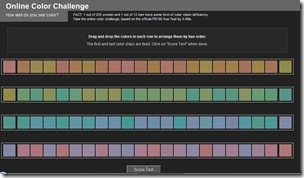 How good are you at placing colors into order by hue? Can you take a stack of blue fabrics and arrange them from light to dark easily? How about red? Here’s a fun test to see how well you do at this skill. Give it a try! « Have You Seen This Fabric? I got a four. cool test. I got a 45. Guess I am middle of the road. Wonder if it changes with time of day. I just got up!!!!! Interesting test! I got a 9. I thought I did really well, but I got a 35! Martha~4! Impressive. Oh wow, I got an 82, thought I was pretty good, but I was wrong. I'm with Martha – I got a 4. I'm in the 40-49 age range! Would increasing age lead to increasing scores? this is too cool! I got 0…I always thought I had a good eye for color…the rest of my vision, not so good. LOL!!! Thank for the fun post!